Not to be confused with Alfa Bank (disambiguation). Alpha Bank is the fourth largest Greek bank by total assets but the largest by market capitalisation of 2.7 Billion Euro as of 2 December 2016. It has a subsidiary and branch in London, and branches and subsidiaries throughout Southeastern Europe (see "International expansion" below). Founded in 1879, it has been controlled by the Costopoulos family since the very beginning. Currently Ioannis Costopoulos, who is the grandson of the original founder John F. Costopoulos, and the nephew of Stavros Costopoulos, Foreign Minister in the government of Georgios Papandreou, is the honorary Chairman. In 2013 Alpha Bank acquired the entire share capital of Emporiki Bank. On 31 May 2013, the Bank proceeded to a successful recapitalisation with oversubscription of the required private-sector participation in the Rights Issue, which resulted in the preservation of Alpha Bank's private character. On 31 March 2014, Alpha Bank successfully completed its Euro 1.2 billion capital increase. 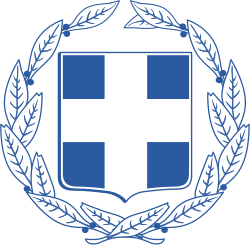 On 17 April 2014, the Bank redeemed the total amount of the Hellenic Republic's Preference Shares. On 26 October 2014, Alpha Bank announced the successful completion of ECB’s Comprehensive Assessment in the Static Adverse Scenario with CET1 8.07% and Capital Surplus of Euro 1.3 billion. 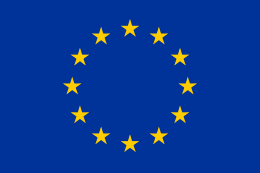 Based on the dynamic adverse assumptions, CET1 stands at 8.45% with Capital Surplus of Euro 1.8 billion. On 16 January 2015, Alpha Bank requested Emergency Liquidity Assistance (ELA) from the Bank of Greece. Its total funding from the ECB (ELA and non-ELA) was €29.9 bn as at 30.9.2015. On 17 July 2015 it sold its Bulgarian branches to Postbank (Bulgaria) the subsidiary of fellow Greek bank Eurobank Ergasias. 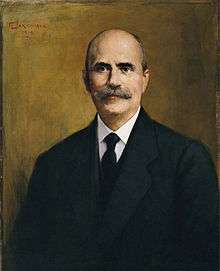 In 1879 John F. Costopoulos established a small commercial firm in the city of Kalamata. In 1918 the banking department of the "J.F. Costopoulos" firm changed its name to Bank of Kalamata. In 1924 the bank moved its headquarters to Athens and changed its name to Banque de Credit Commercial Hellenique. In 1925 (on November the 2nd) the bank was listed on the Athens Exchange. In 1947 the bank changed its name to the Commercial Credit Bank (CCB). In 1972 the CCB changed its name to Credit Bank (Trapeza Pisteos). In 1994 Credit Bank changed its name to Alpha Credit Bank (ACB). In 1999 ACB acquired 51% of the shares of the Ionian Popular Bank. In 2000 ACB absorbed the Ionian Popular Bank. In the same year ACB changed its name to Alpha Bank. In 2002 Alpha Bank's attempted merger with National Bank of Greece fell through. In 2012 Alpha Bank called off its merger with Eurobank Ergasias, which was announced the previous year. In 2012, Alpha Bank acquired the Greek part of Emporiki Bank from Credit Agricole for €1. The legal merger was completed on 28 June 2013. In 2013, Alpha Bank took over the deposits of Cooperative Bank of Dodecanese, Cooperative Bank of Western Macedonia and Cooperative Bank of Evia. In 2014, Alpha Bank took over Citibank's Greek retail banking operations. Building of the Alpha Bank in Cannon Street, London. In 1960 Commercial Credit Bank established a subsidiary in Cyprus that it may later have closed or sold. In the early 1990s, the bank started on a program of international expansion, especially in Southeastern Europe. In 1994 Credit Bank and the EBRD established "Banca Bucureşti" in Romania, which commenced operations the next year. Credit Bank owned about 50% of the bank. 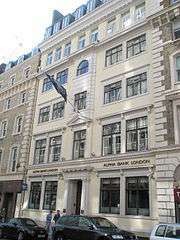 In 1994 ACB acquired Commercial Bank of London from Commercial Bank of Greece (Emporiki Bank) and renamed it Alpha Credit Bank London. In 1998 ACB established a branch in Tirana, Albania, and followed that with three more branches. In 1998 ACB acquired 82.5% of Lombard NatWest Bank in Cyprus and renamed it Alpha Bank Cyprus Ltd. In 1999 ACB acquired 65% of Kreditna Banka, Skopje, Republic of Macedonia. (see Alpha Bank Skopje). In 2000 "Banca Bucureşti" changed its name to "Alpha Bank Romania" (ABR). Banca Monte dei Paschi di Siena took a 5% share of the bank. Alpha Bank’s share became 63%. ABR itself acquired a 12.5% stake in Victoria Bank (est. 1989), the largest private bank in Moldova. In 2002 ACB acquired the minority stake and became the sole shareholder in Alpha Bank Skopje, accounting for 100% of its share capital. In early 2005 Alpha Bank acquired 88.64% stake in Serbian Jubanka and changed its name to Alpha Bank Beograd and then to Alpha Bank Srbija. Alpha Bank also has an extensive branch network in Bulgaria, the foundation of which it inherited from Ionian and Popular Bank, which entered in 1994 with a representative office in Sofia. On March 27, 2008, Alpha Bank reached a deal to buy a majority stake in newly established OJSC Astra Bank in Ukraine as part of plans to expand in the region. Alpha Bank agreed to buy 90 percent of Astra Bank for 9 million euros. Astra Bank become insolvent in March 2015 and in July 2015 it was acquired 100% by Agro Holdings (Ukraine) Limited (a company owned by the US-based NCH Capital). In addition, Alpha Bank has a branch in London and a finance company, Alpha Finance US, in New York. The latter does not exist anymore. The company is listed on the Athens Exchange with stock symbol ALPHA; the ISIN is GRS015013006. As of 11 August 2015 the number of securities outstanding and the number of securities listed is 12769059858 (around 12.7 billion). The stock is one of the 25 stocks in the FTSE/Athex Large Cap index (11 August 2015). ↑ "FY2015 Results" (PDF). Alpha Bank. Retrieved 4 Mar 2016. ↑ "Greek Alpha Bank hits recap target, rights issue oversubscribed- sources". www.reuters.com. Retrieved 31 May 2013. 1 2 3 "ALPHA Stock Overview". Athens Exchange Group. 11 August 2015. Retrieved 11 August 2015. ↑ Fabio Benedetti-Valentini and Elisa Martinuzzi (17 October 2012). "Credit Agricole Exits Greece Taking Profit Hit on Unit". Bloomberg. ↑ "Nine Month 2014 Results: Profit after Τax at Euro 110.5 million". www.londonstockexchange.com. Retrieved 4 November 2014. ↑ "Alpha Bank SA undertakes the deposits of three Cooperative Banks". Reuters. 8 December 2013. ↑ "Turkish regulator blocks bank sale". Financial Times. 2007-08-10. Retrieved 2015-01-16. ↑ "Greece's Alpha Bank to buy Ukraine's Astra Bank". Reuters. 2008-03-27. Retrieved 2012-02-20. ↑ "FTSE/Athex Large Cap Index composition". Athens Exchanges Group. 10 August 2015. Retrieved 11 August 2015. Wikimedia Commons has media related to Alpha Bank.